One issue I've had with our life in general is that I don't feel like my kids are getting anything at all like the basic theological foundation that I experienced during my two years of confirmation classes. My adult son is going through a New Member Class at church that seems to be covering a lot of that type of thing. And eventually I'll find something to do with my other teens, I am sure. But I've found a fabulous option for my elementary/middle school children. 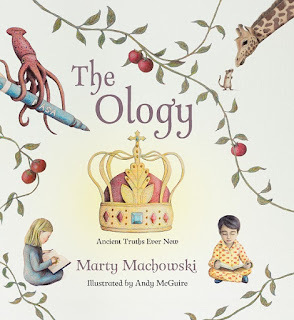 The Ology: Ancient Truths Ever New by Marty Machowski is a fantastic book. I may even use it with my teens on our second run through it, but more on that later. Systematic Theology for kids. Seriously, how much better does it get than this? We are working through one section per day, which is suggested in the introductory materials. 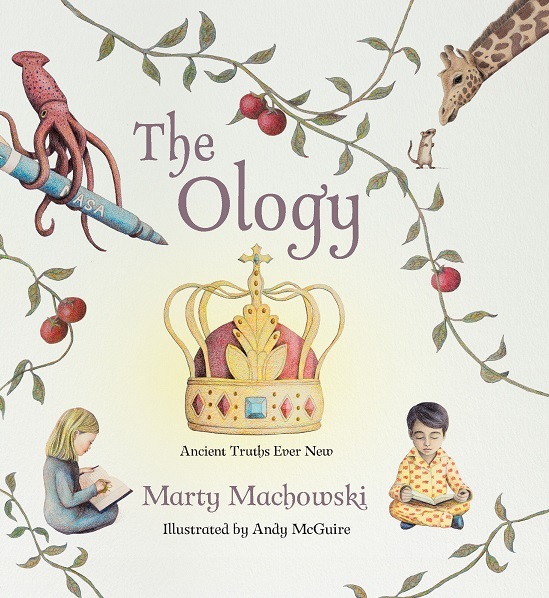 for ages 10-12, they suggest reading through the book to get a big picture overview of the theology covered here. Then, the suggestion is to go back through the book, one section at a time, looking up the Scripture references, which are incorporated into the beautiful illustrations by Andy McGuire. They can journal their way through this, listing the Scriptures, commenting on how that ties together, and also answering discussion questions. I suspect that we will just discuss the discussion questions, but I love the idea of them putting together a journal. I'm impressed. Go see a sample of The Ology for yourself. And then go see what others had to say on this Blog Tour.